Every year hundreds of New Zealand businesses send Gourmet Direct meat hampers to their valued clients. Most of the activity occurs around Christmas. We do however offer a year round service for corporate gift ideas and internal and external incentive programmes. We handle small and large volumes and we do it well. You can choose from our existing range of Gift packs, design your own. We will design one for you or you can opt to send Gourmet Direct Vouchers personalised for your company – either monetary or assigned to a hand picked Gift Pack. We have the facility to accept additional items for inclusion in a Gift Pack which you may wish to provide. Here’s another great idea! 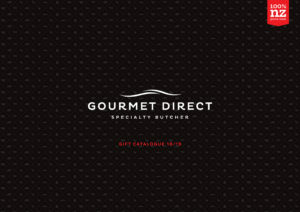 Drive sales and productivity by offering a scrumptious Gourmet Direct Gift as a performance incentive for your staff. Whether it’s a seasonal or monthly programme or an on-the-spot reward, you won’t be disappointed with our performance! We have a sister company set up to assist you with sending gourmet gifts of distinction overseas. We operate this service from New Zealand so you are still dealing with us. You receive the same high level of service and can be assured of a safe environment for your credit card transaction. Via A Taste of NZ we can help you to send New Zealand product from NZ to most international destinations but even better we can arrange speedy delivery of that last minute gorgeous gift to the UK, Europe and the USA.